So in my last post I looked at how to use an UpdatePanel to do data paging and then optimising the HTML to get the best performance from our requests, but it still wasn't optimal. Although we can optimise the UpdatePanel response we can't do much about the request, and especially with regards to the ViewState within a page, which is the real killer. There's plenty of ways to go about client-side templating, you can write your own templating engine, it's not hard, I had a crack at it and wrote a client-side repeater which consumed data from a webservice in only a few hours. Or you can use any of the premade template engines. I'm a fan of the jQuery plugin, jTemplates or you can use the templating engine which is part of Preview 1 of the Microsoft AJAX 4.0 library. Lets have a look at both. Well the first thing we need is to be able to get the data, so we'll create some webservices and set them up for JSON transmission on the data. You'll notice there's 2 services, one for the returning of the People collection in a paged format, thanks to some lovely LINQ extensions, and one to get the total number in the collection (which we'll look at later). 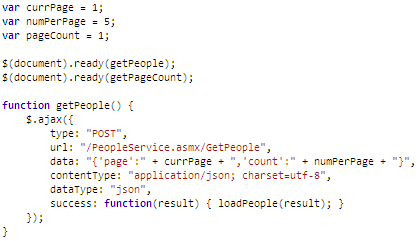 The getPeople method will handle the AJAX request and then I have a separate load method in the form of loadPeople. getPeople will be used when ever we want to refresh the pages data. When doing the AJAX request we need to pass in parameters the webservice requires. 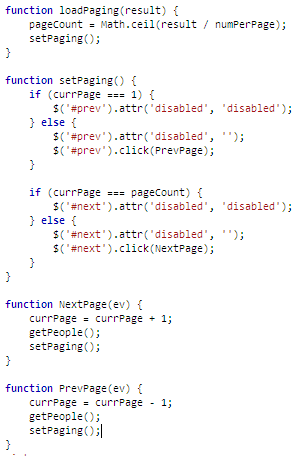 It's best to check out the jQuery documentation for how the various properties on the $.ajax function operates. The loadPeople is where we actually create the client template instance and load the data into it. Yes, it's that simple to create a client template. Because the result is in JSON we don't need to worry about any kind of conversion. Just to make it a bit cleaner I'm also disabling the buttons when they are not required. I'm sure you can deduce from the above that it was much more efficient. We've got a much smaller page load, and then the request is only a fraction of what the UpdatePanel one is! And we don't have the problem of submitting the ViewState either! I really like this template engine of jTemplates, it's much simpler (but evidently less powerful) to implement, there's no really wierd syntax needing to be remembered. The only wierdness is that the template much be a class named sys-template so the engine knows to now display it. Very much like a .NET DataBinder control. I wont bother showing the request/ response info as they are virtually identical to what was seen in the jTemplates example. Hopefully this is gives a useful insight into the world beyond ASP.NET. And to wrap it all up here's the sample project to play with yourself.